Butterick “waist” pattern 9415 was shown with added embroidery in this October, 1917, article. Delineator, p. 100. 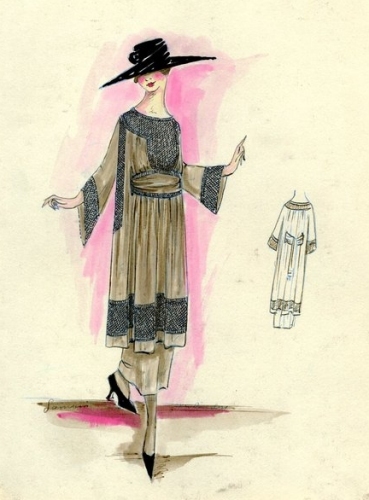 I’m charmed by this asymmetrical blouse (called a “waist’) from 1917; Butterick must have had faith in the design, too, because this pattern was featured several times between October and December in Butterick’s Delineator magazine. Right, “waist” [blouse] pattern 9415, Delineator, Oct. 1917. Page 76. Many other fabric combinations were suggested. It was featured in an article about making new clothes from old, this time in black velvet and black satin. “Remake last year’s dress,” using waist pattern 9415. Delineator, Oct. 1917, p. 93. Butterick waist [blouse] pattern 9415 made of sheer, royal blue Georgette and satin, with matching sequin trim at neck and sleeve. Delineator, Dec. 1917, p. 69. “Paris has made a compromise and adopted the semi-evening gown (designs 9415 — 9536) which, most of the time, is a bit of transparency trying to disguise itself as a high neck and demure long sleeve.” The sheer sleeves could also end in gathers at the wrist. Depending on fabric choice, Pattern 9415 could be part of a dressy day outfit, an elegant afternoon dress, or a “semi-formal” evening gown. And, as was customary in 1917, the bodice could be combined with different skirts. Note: In Victorian times, when skirts used a great deal of costly fabric, smart women had two bodices made to coordinate with one skirt. Usually there was a daytime bodice with long sleeves and a high neck, and an evening bodice, which bared the arms, the shoulders, and a good deal of the bust. At a time when wearing evening dress for dinner was expected, this must have simplified travel and country house visits. Each time Pattern 9415 was illustrated, it was shown with a different skirt pattern. Right, waist pattern No. 9415 with skirt pattern 9418. October, 1917, Delineator, p. 76. Although it looks olive green to me, Delineator described it as battleship-gray. 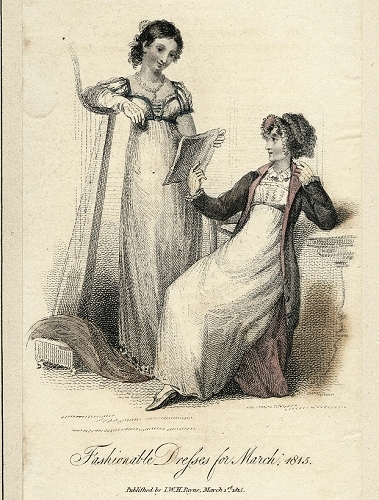 “French lining” means a closely fitted bodice inside the garment; it would support and stabilize the fashion fabrics, especially when they were draped, as in No. 9415. Waist 9415 with skirt 9418, October, and and skirt 9418 illustrated in November, 1917. Obviously, you could trim the blouse’s collar with embroidery and a tassel, in this variation. Butterick “waist” pattern 9415 with added embroidery. When No. 9415 was suggested as a way to recycle old dress fabric, skirt No. 9408 was suggested; perhaps you could salvage a strip of velvet for skirt front and back and enough to cover the bottom of the skirt; the fabric under the satin sides of the skirt would not be visible. Bodice 9415 with another skirt, No. 9408; October, 1917, Delineator. The “semi-evening” combination of waist pattern 9415 and skirt pattern 9536 used chiffon in the bodice and overskirt. Left, Waist 9415 with skirt 9536; right, evening wrap pattern 9578. Delineator, Dec. 1917, p. 69. Butterick Waist 9415 with skirt 9536, Delineator, December 1917. In the theatre, a bodice and skirt like this would be attached by hooks and bars at side front, sides, and side backs — hooks on the inside of the bodice, bars on the skirt, hidden by their overlap. What is not illustrated is the closures — how do you get in and out of these clothes? 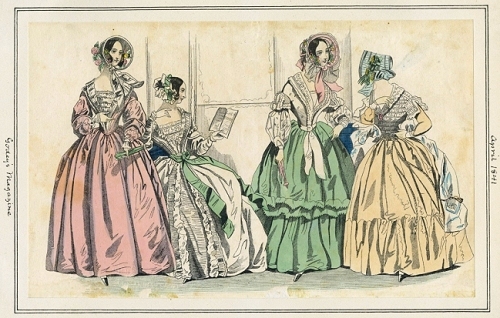 Dresses of this period often have a closing in a different place in each layer — such as at the center front of the French lining, and at the side of the fashion fabric, which in turn would be hidden by the wrapped sash and more snaps or hooks to hold that in place and conceal the opening. 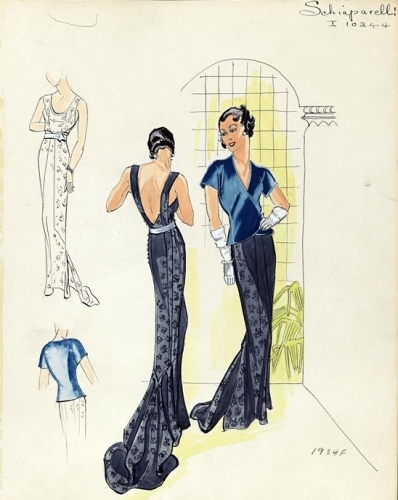 Click here for another set of 1917 waist and skirt combinations.